What they say about parenting is true. Once you become a parent, no matter what your other accomplishments in life, your children become your greatest accomplishment. Your pride and joy, your lessons in humanity and humility, your rediscovery of innocence… your children are what you measure all of these by. Every parent feels every breath their children take. Every parent feels every wound and slight and joy and all the emotions their children feel. Parents relive every single moment of their lives through their children’s perspectives. And when children fall unwell, there is no greater agony for parents. 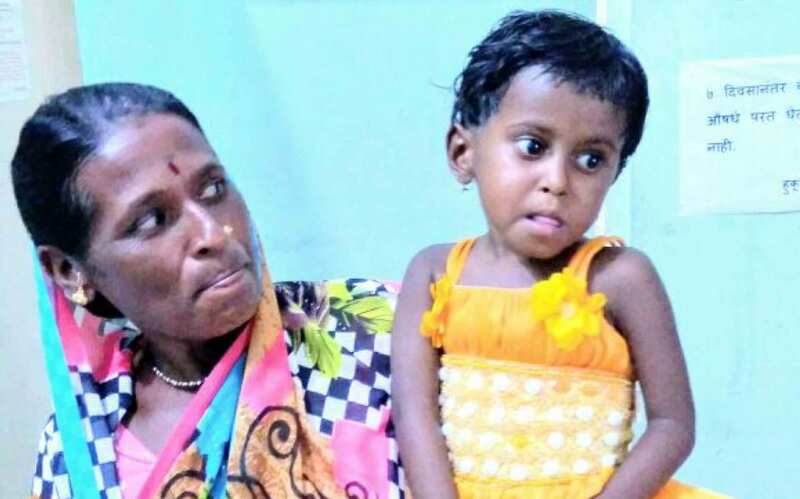 Imagine then the anguish Monika Shermale’s parents felt when, at the age of 3, she was diagnosed with Acute Lymphocytic Leukamia. Residents of Samnapur Taluka in Sangamner, Ahmednagar, the Shermales were shattered when they received this diagnosis. Monika started receiving treatment – chemotherapy – at Dr. Mane Medical Foundation’s Saidham. The treatment started showing results with doctors forecasting a 90% chance of complete remission following six cycles of treament. Chemotherapy isn’t inexpensive though. The drugs involved in chemotherapy are super expensive and the Shermales – with an annual income of less than Rs. 60000 – weren’t in a position to afford continued treatment for their Monika. The hospital charges for each cycle alone came to Rs. 10000. After two treatment cycles, the Shermales still needed more than Rs. 130000 for the remaining four cycles. This was after Dr. Mane kindly waived off all the hospital charges. This is where we stepped in. We helped source all required drugs at a low cost and raised Rs. 96500 for Monika’s treatment cycles. The treatment was a roaring success with Monika going fully into remission. Today Monika is living a healthy, happy life with her parents, exploring the world with all the joy and curiosity children approach life with.